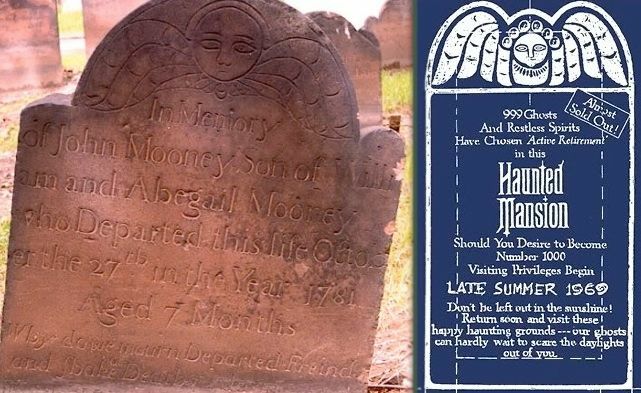 Updated May 26 and Nov 21, 2012.
original post in light of new evidence that surfaced in November 2012. Neat and clean as a dress uniform. 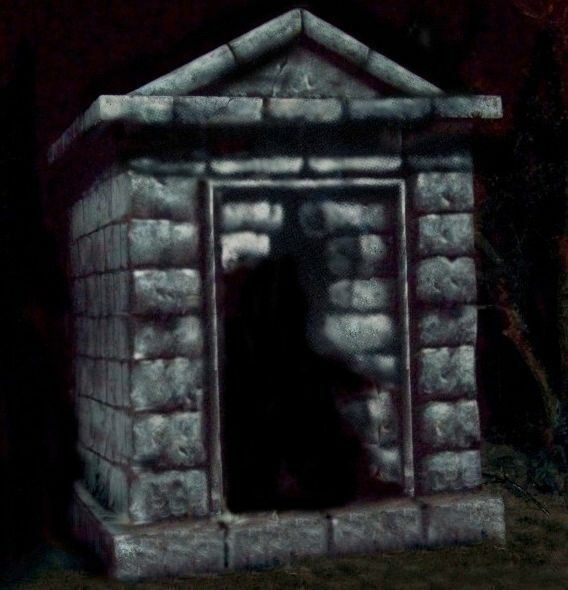 Not spooky, but sombre. 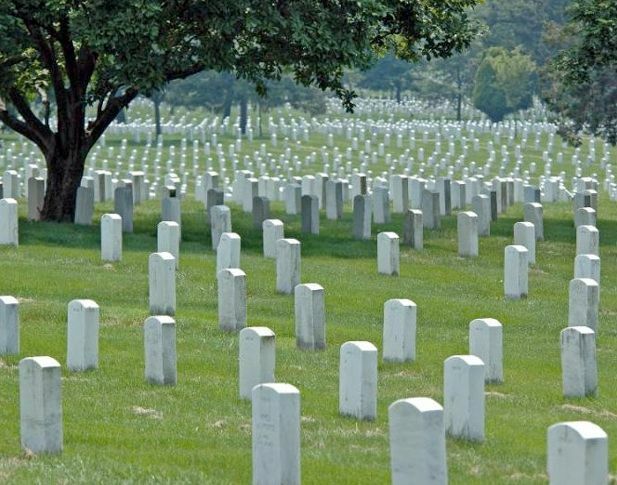 For a contrast, you could compare Arlington with another famous boneyard, thought to be the most visited cemetery in the world, Père Lachaise in Paris, the final resting place of a million dead. 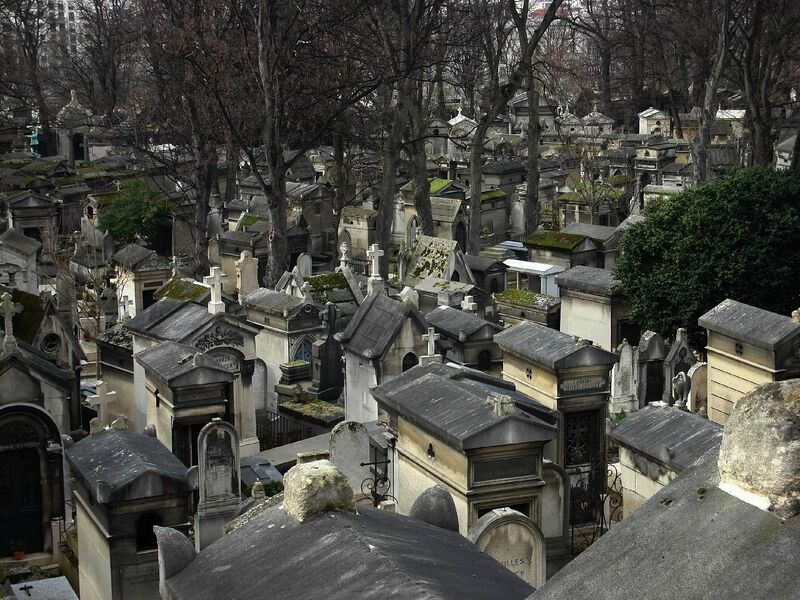 Visitors come to see the graves of famous people, but also for the sheer spectacle. 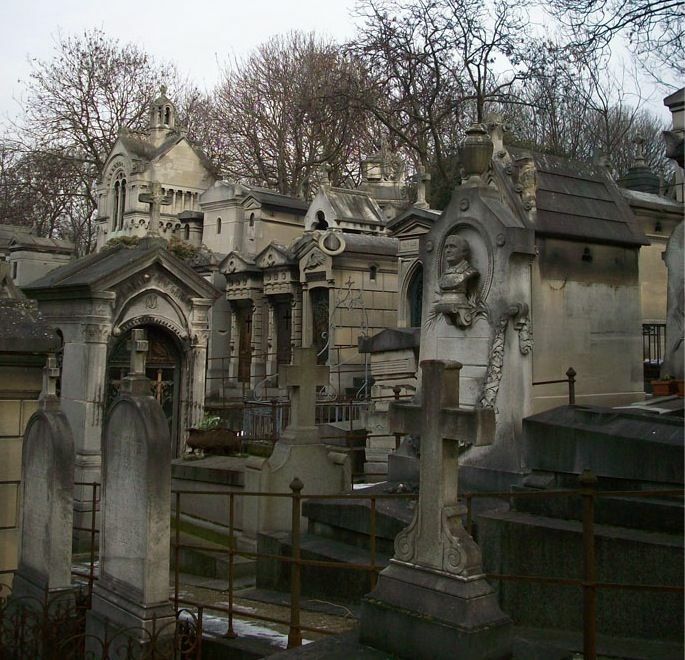 It's a dense necropolis that covers 110 acres. One imagines that the wind moans and howls when it blows through there on a blustery night. 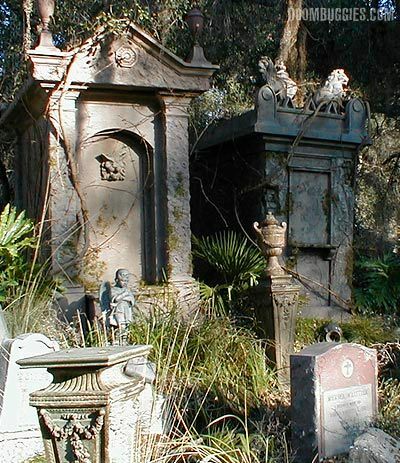 There have been two occasions within the Haunted Mansion imaginative universe when the Père Lachaise look has been attempted. 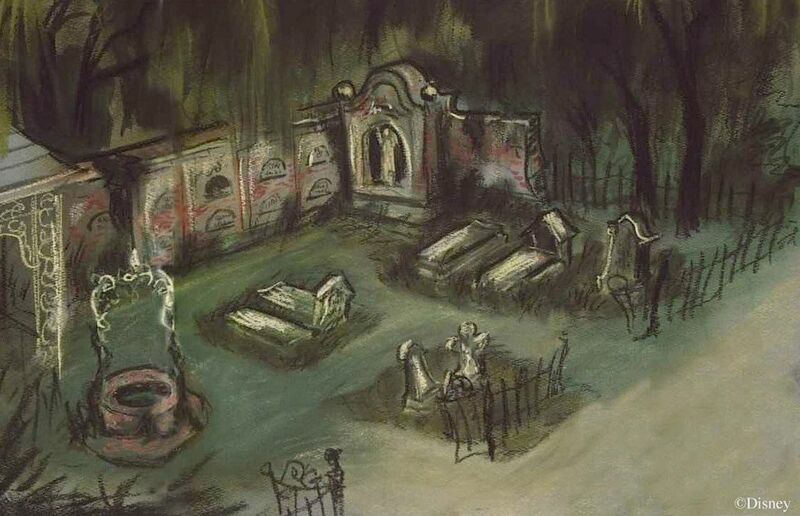 At first blush, you might think that the climax of the show, the graveyard jamboree, is one of them. 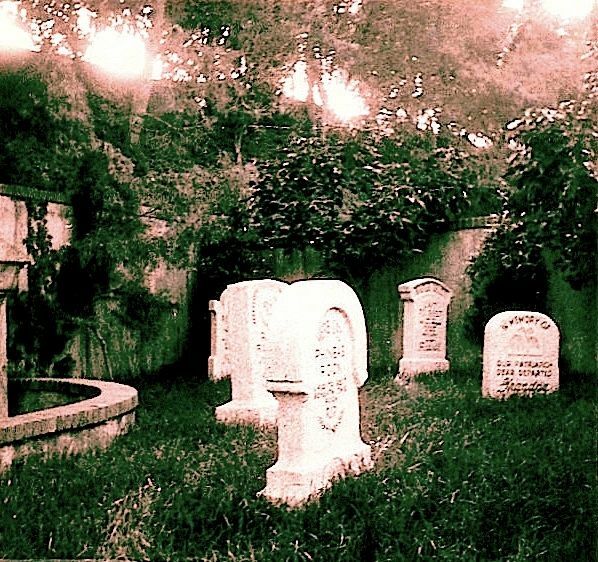 After all, it is supposed to be a very old public cemetery next to which the Mansion was built early in the 19th century, and it's supposed to be a pretty big one. 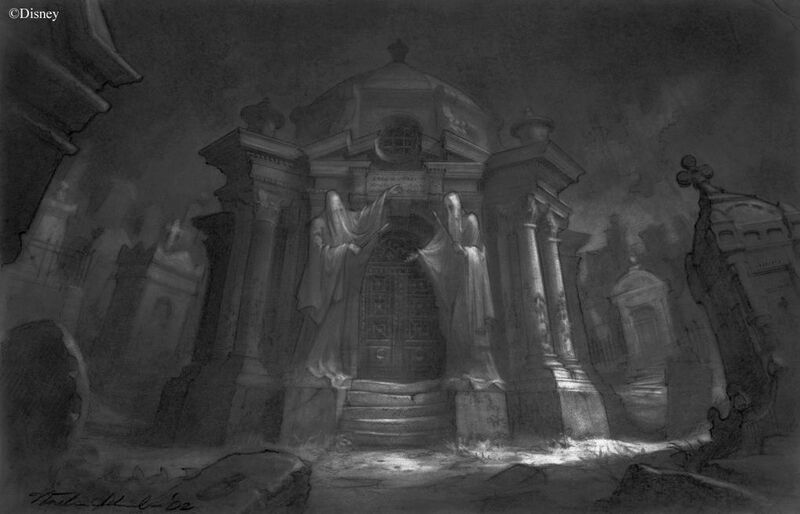 (As I've mentioned elsewhere, the tombstones and crypts toward the back are smaller than the ones in the foreground, using forced perspective and darkness to make the place look bigger than it is.) When you come out on the balcony, you do get an impressive panorama. 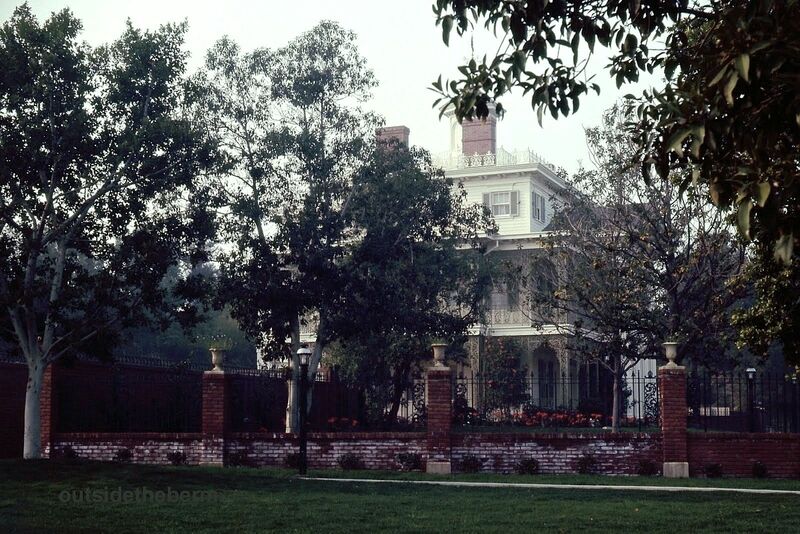 This is a still from the film that was taken in the summer of 1969, probably before the big scrims went up. 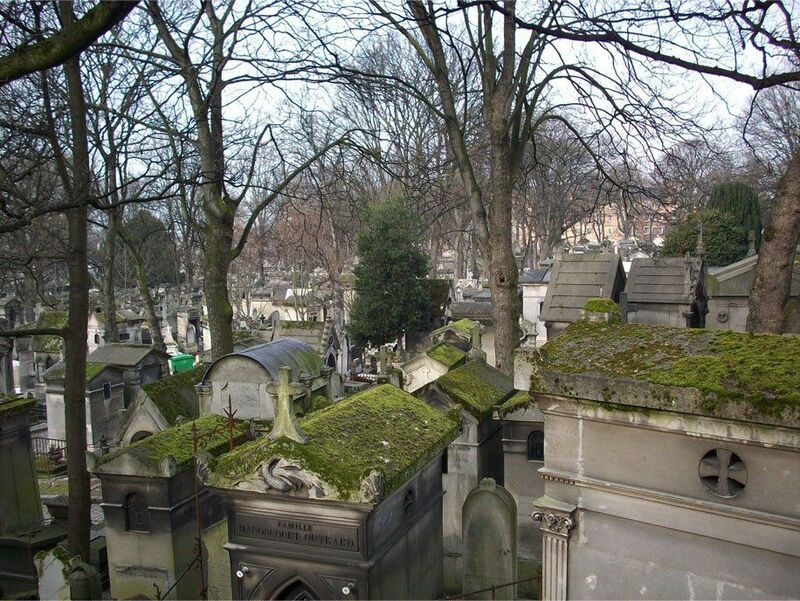 From up here it does have something of that crowded, sprawling, ancient, Père Lachaise look, but when you get closer, you see that it really isn't in that style. 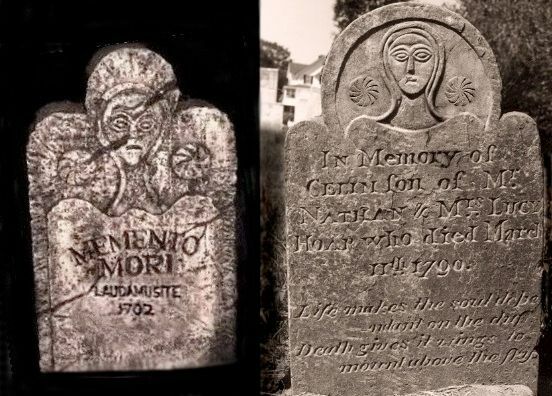 The tombstones, which we've examined before, are modeled on 17th—18th century New England grave markers. Those are Disney stones on the left, specimens from the amazing Farber Collection on the right. 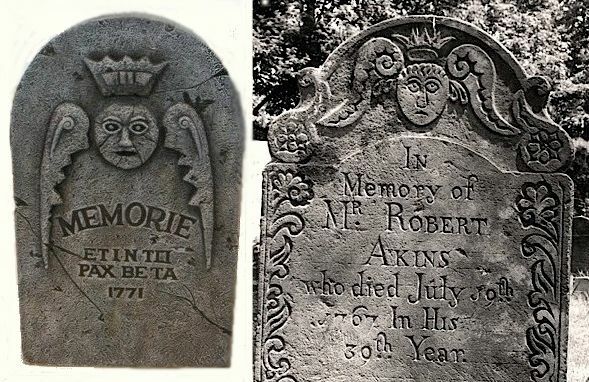 Incidentally, you sometimes find the influence of this style elsewhere in HM iconography as well. 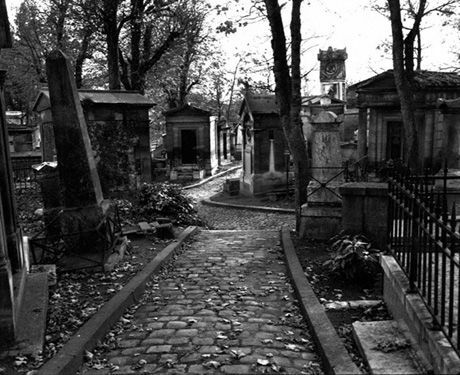 The most striking feature of the graveyard, however, is how plain it is. 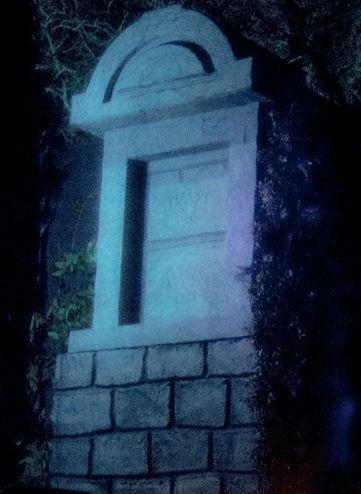 Those tombstones are actually the fanciest things there. There is no statuary other than the singing busts. 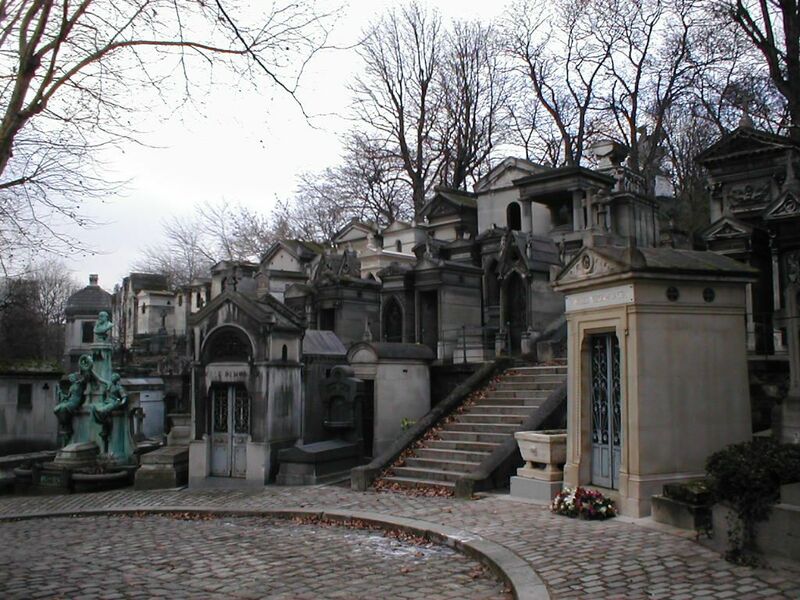 The sarcophagi are bare stone boxes. 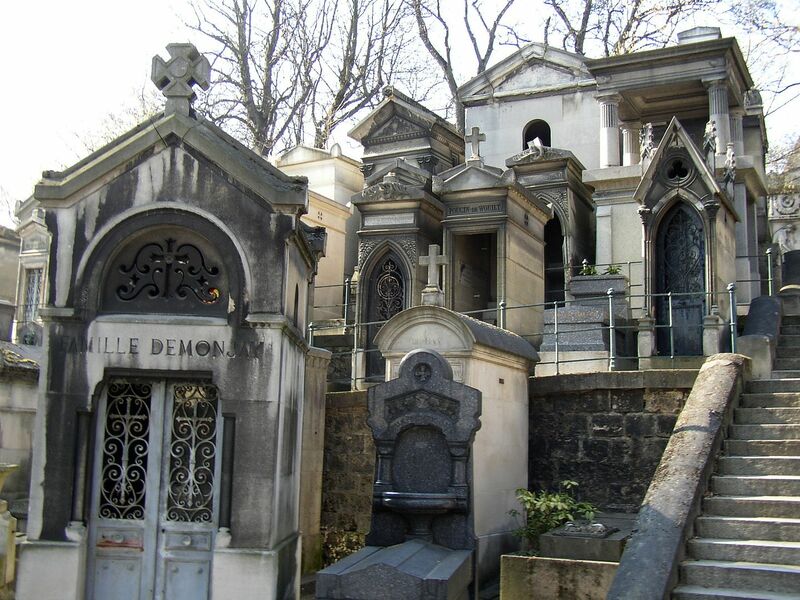 Most of the crypts are also utterly devoid of decoration, and none of them has any writing on it. They're just boxes made out of stone blocks. 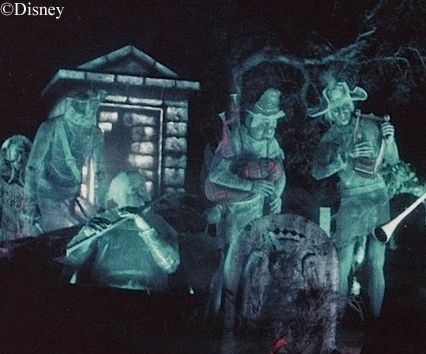 You don't really notice any of this because you're looking at the ghosts, the characters. And of course, that's precisely the idea. exception, part of a unique gag. Elsewhere, you find only a severe simplicity. I think that once again we are seeing the influence of Claude Coats. Recall from the previous post that Marc Davis described how Coats provided the stages upon which his characters performed. 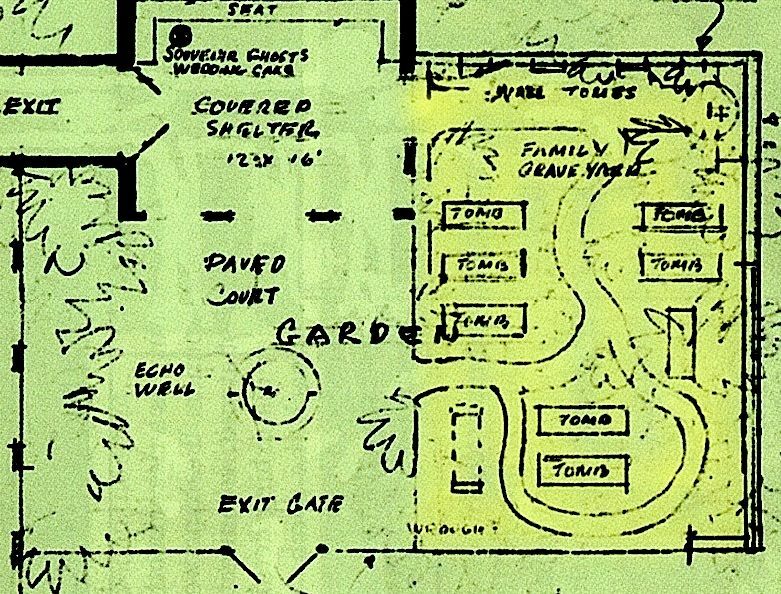 Like the skilled background painter that he was, Coats was careful not to design a setting that would upstage the performers. 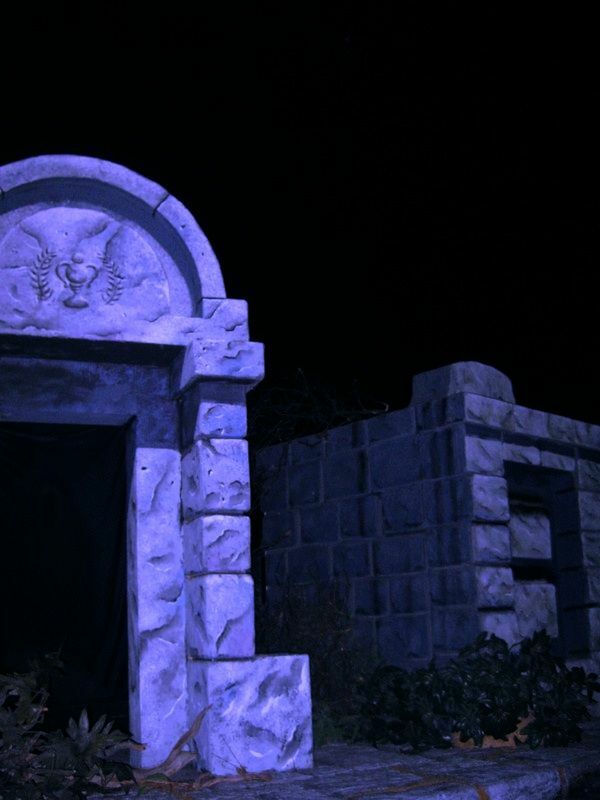 With their rugged stonework, the crypts are certainly not unattractive, but they don't steal your attention away from the actors. 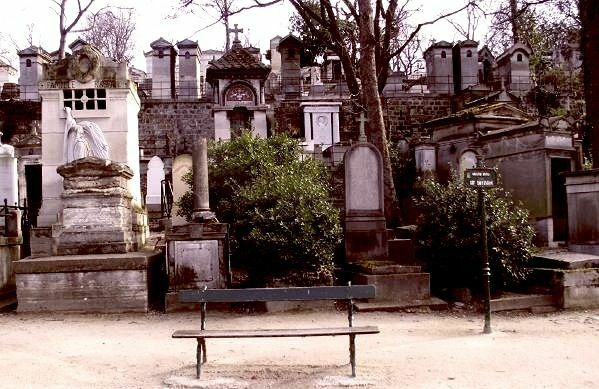 With Père Lachaise, it's the opposite. 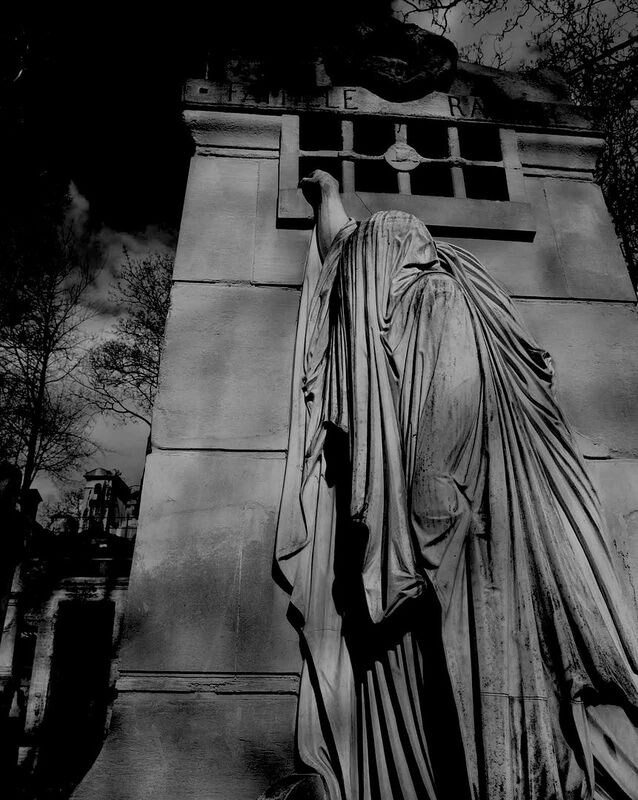 There isn't a soul in sight, and every monument is vying for your undivided attention. Detail abounds. "Look at me!" "No, me!" 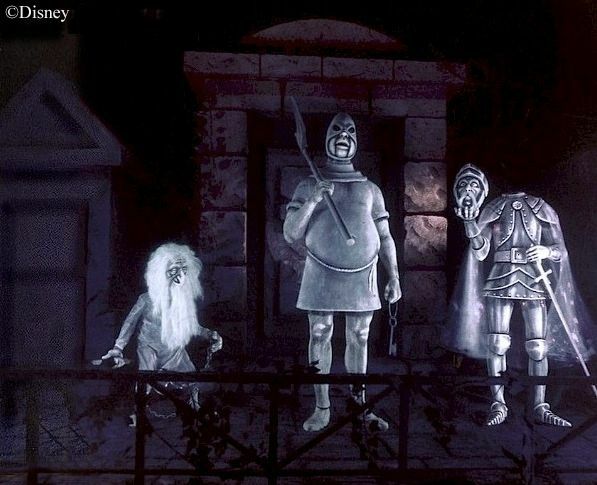 This is not to say that the background artwork at the Mansion's midnight jamboree has nothing important to do. 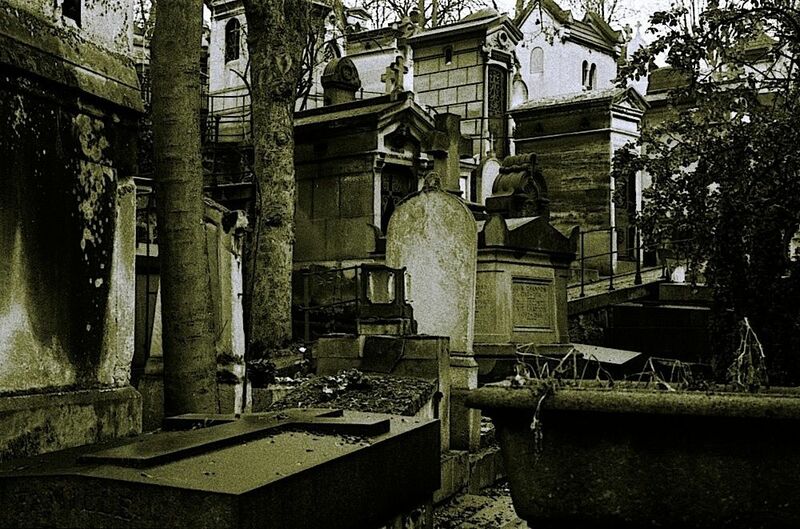 The cemetery is supposed to look old and crumbling. 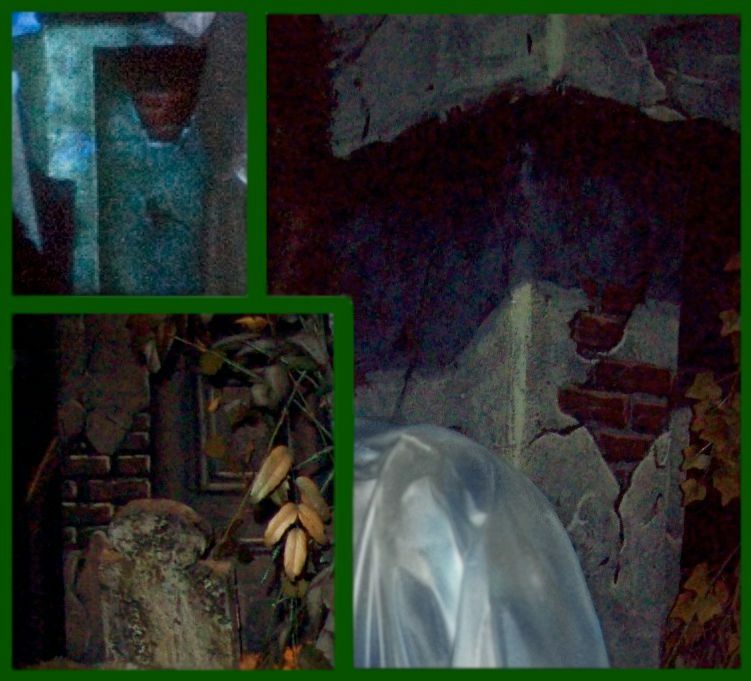 To that end, there are places where they have the plaster falling off and the underlying brickwork showing through, but it's not likely that many guests notice this, because some of it is well-nigh invisible under normal show lighting conditions. One of the pleasures of doing a blog like this is in spotlighting little things that should be seen but which for one reason or another are not. 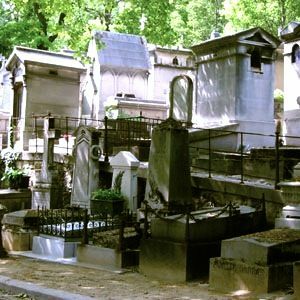 One of the places where you can find the full-on Père Lachaise look is not in the ride but in the much-despised 2003 Haunted Mansion movie. 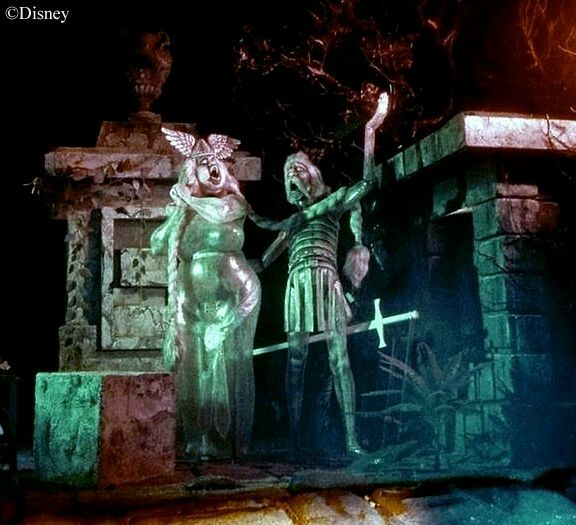 Whatever one thinks of the film, everyone seems to agree that the art direction and set designs were very good. 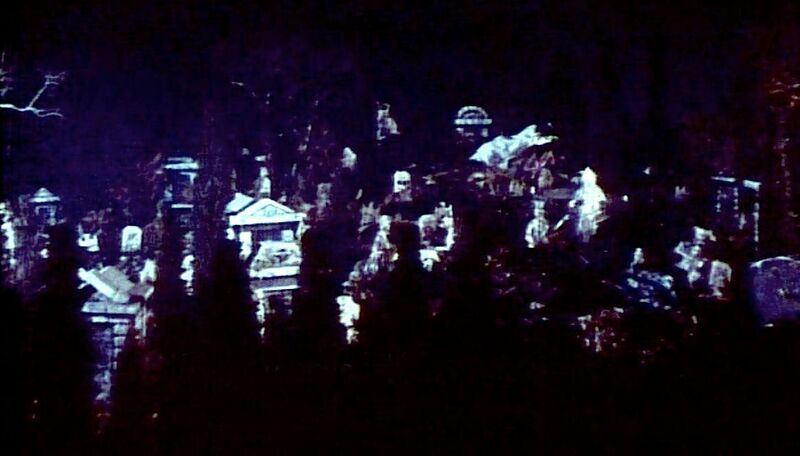 In the film, that cemetery in back of the Mansion is quite a sight. The more you see of it, the clearer it is that Père was a big influence. 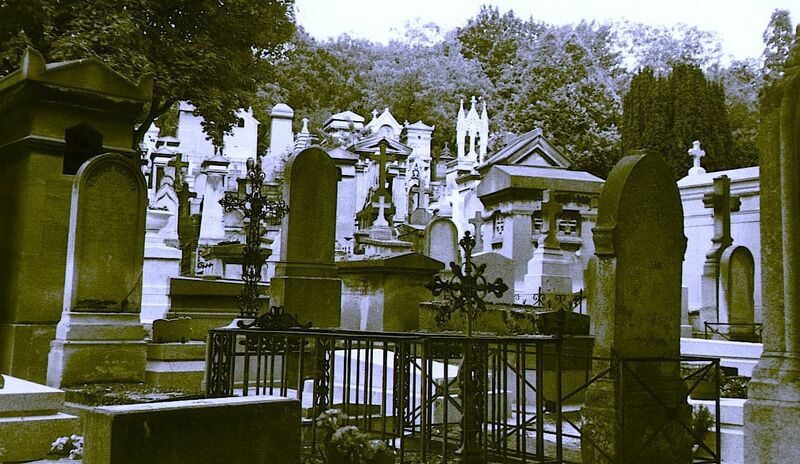 Compare those images with these images from Père Lachaise. 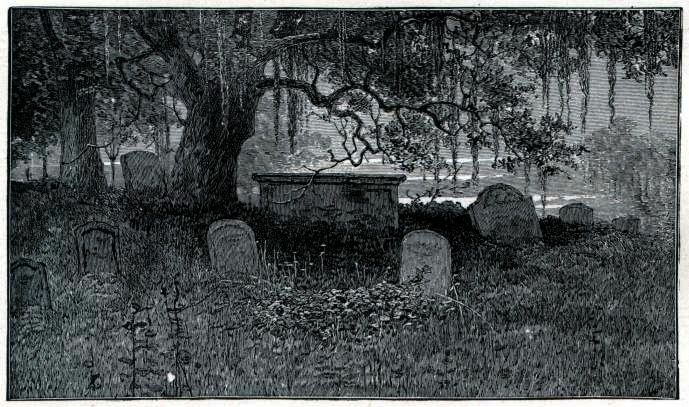 The second place where Père was an influence is the lost graveyard referred to in the title of this piece. This is something no one has ever told us about, Forgottenistas. 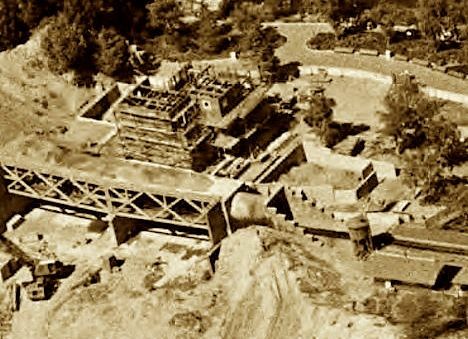 We may begin with a couple of aerial shots taken during the construction of the Haunted Mansion façade building in 1962. Check out that large, trapezoidal, roofless enclosure to the south of the building. What is it? 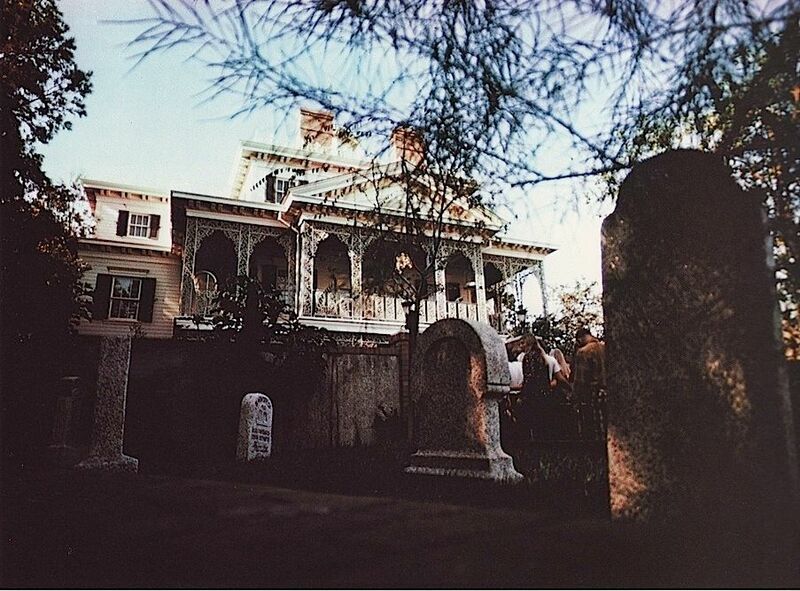 Well, it is recognizable as the place now used for the queue. 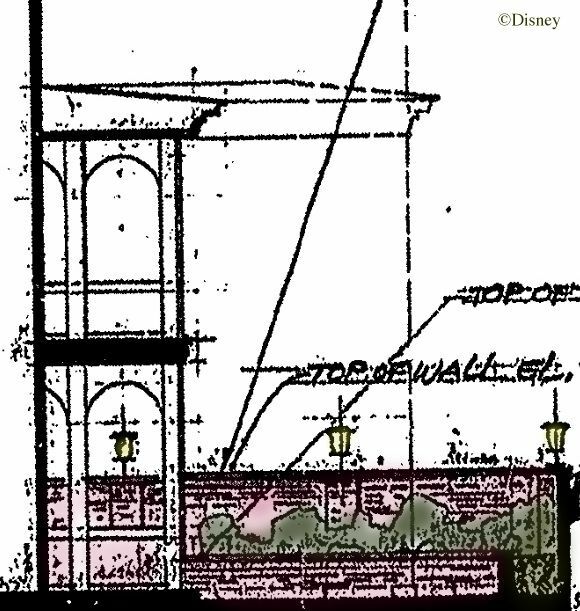 Here's a diagram (adapted from a graphic by Datameister Joe Cardello) which shows that area as it is today, except that I have eliminated the Fastpass garden area. entrance, and they took down the wall closest to the building and redesigned the planter abutting it. you can read That's My Queue, but here are larger versions of some of the photos used in a montage in that post. This one should look familiar. Here's a recent Daveland shot taken from the same spot (i.e. down in the trench). 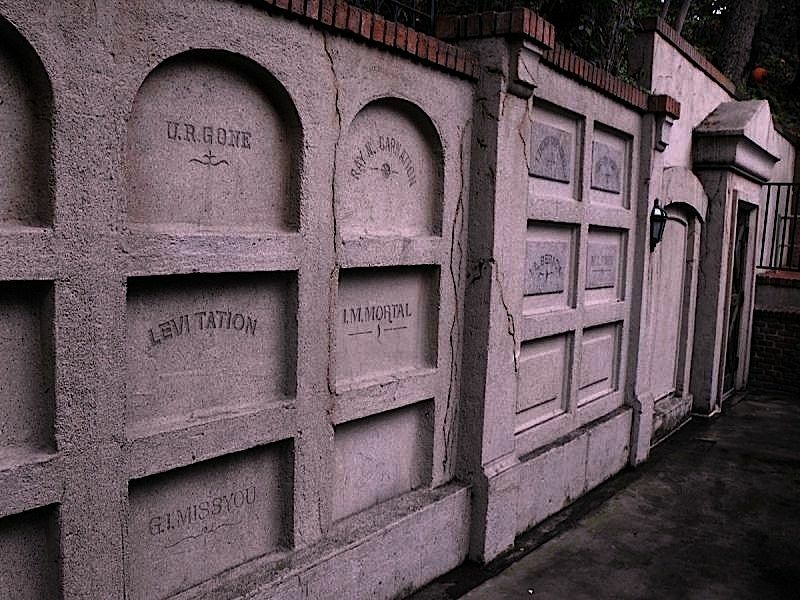 Today, all that is left of any sort of family plot in the area are the epitaphs painted on the crypts along the wall in the corner. 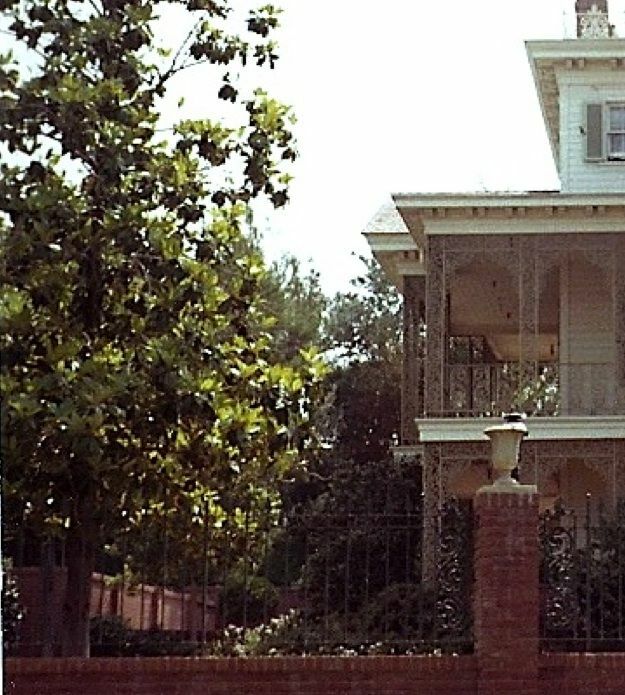 It's not even made clear that these are family members, although one would assume so by their location in the house's front yard. queue but rather as a spill area after the ride where you could take your time and stroll around among the tombs. 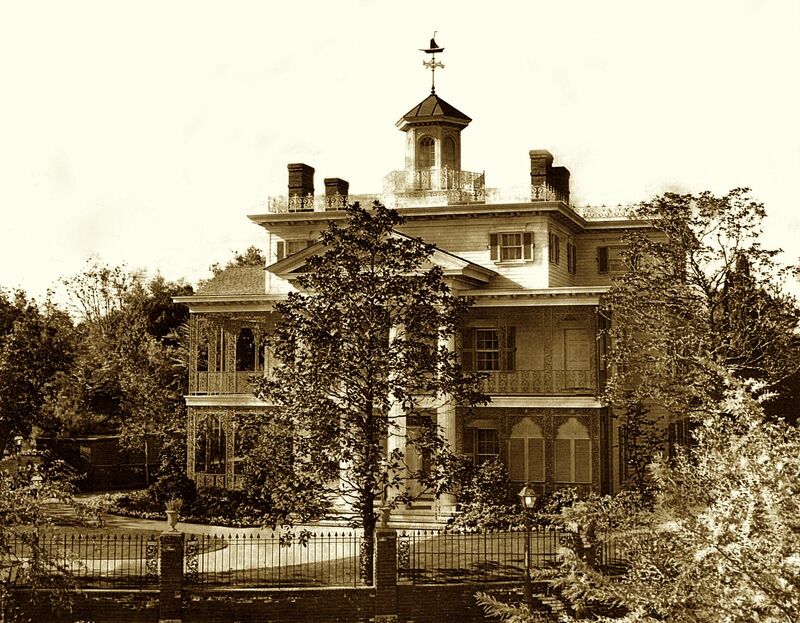 something far more elaborate than the family plot that was there when the HM opened. feet higher. 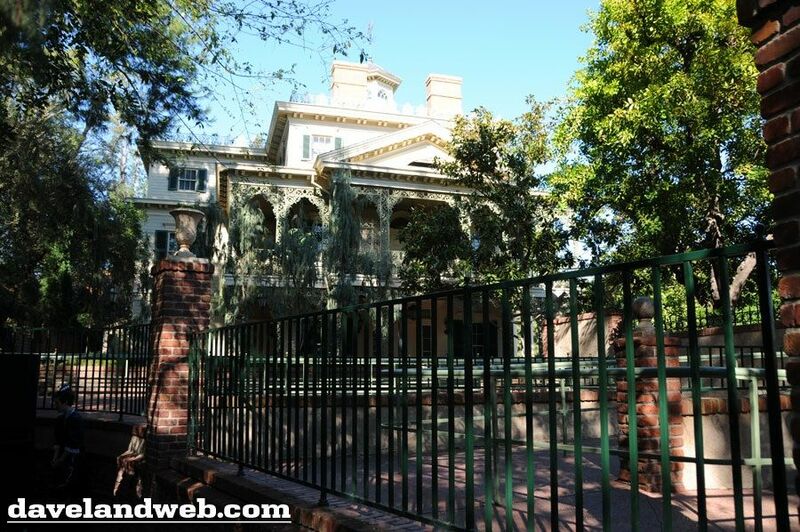 It's been like that since the HM opened, through all the modifications in this area. What I didn't realize until relatively recently is that this ENTIRE AREA inside the enclosure was originally going to be at the same level as the trench is today (or possibly even deeper). 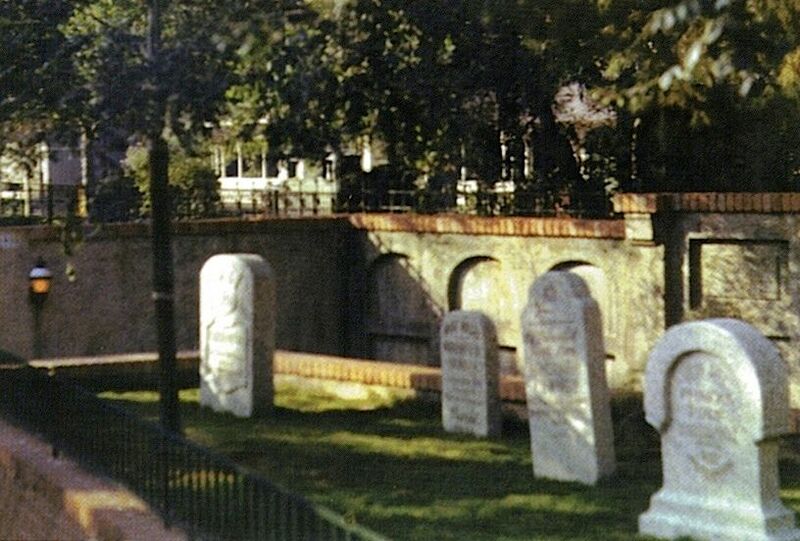 It was going to be the stroll-around graveyard that Anderson originally thought up, but with high walls all the way around. 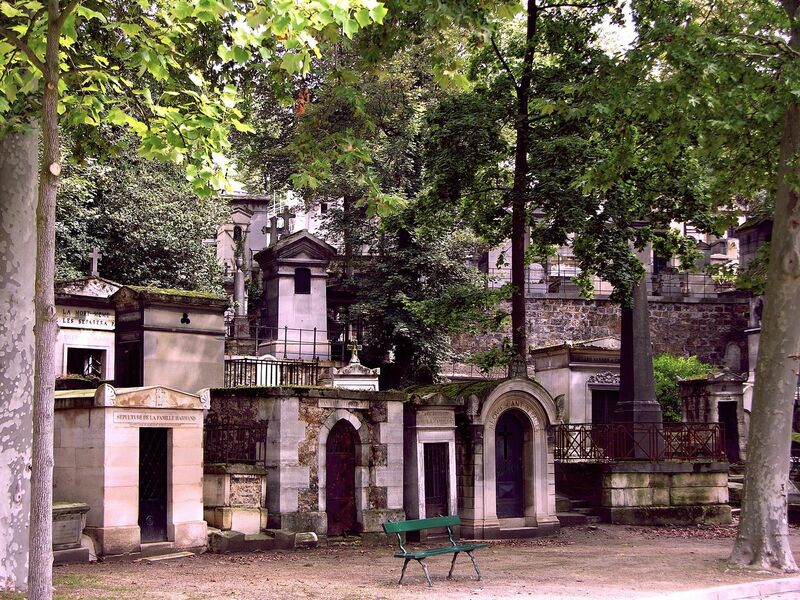 And this graveyard was going to be in the ornate, dense, imposing style of Père Lachaise. 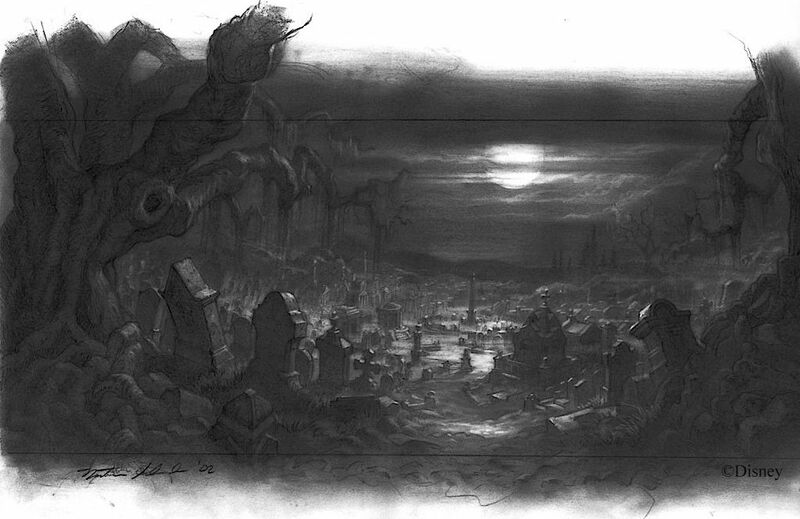 Check out this piece of concept artwork, and compare it to a panorama shot I composed of the same area as it appeared in 1970.
plot graveyard when this area was re-christened as a queue area. 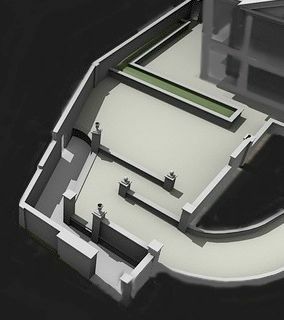 of thing you see in that concept sketch, including the big perimeter wall. 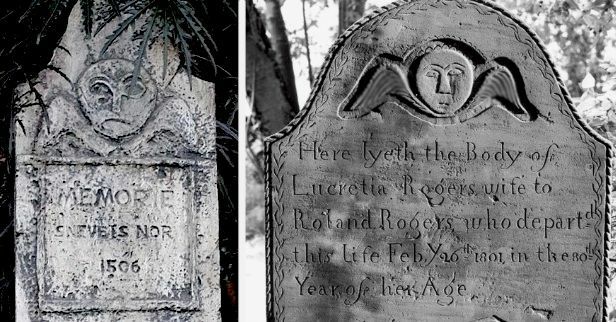 The original "Lost Graveyard" post was reduced to speculation with regard to certain aspects of that original, mysterious courtyard. 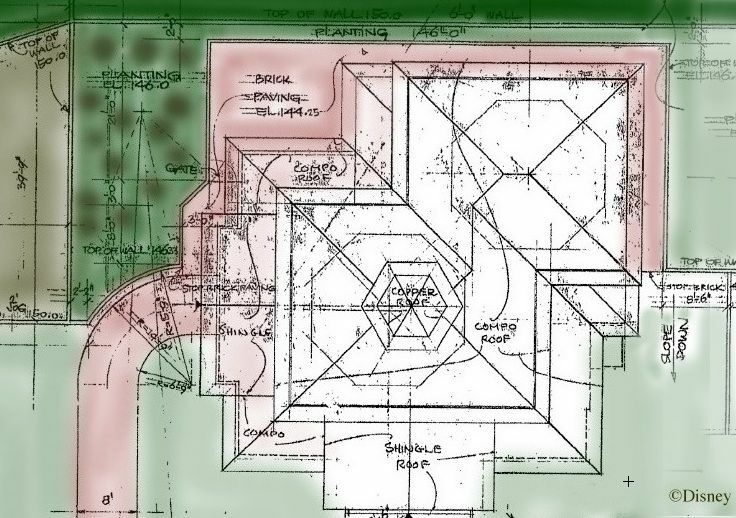 But thanks to the November 2012 discovery of some 1962 blueprints that were new to me, most of the outstanding questions have been answered. 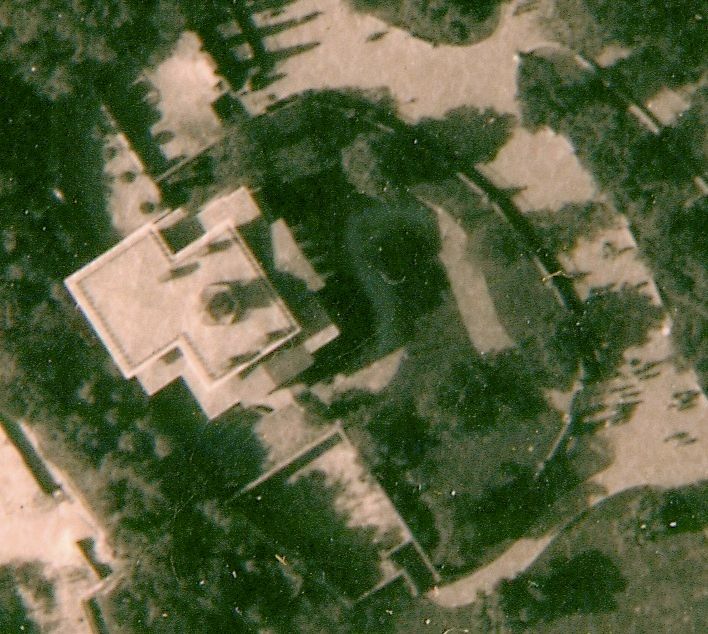 The entrance to the cemetery will be discussed in an upcoming post, so you'll just have to wait for that one, but the design of the northern end was also a real puzzler. That's the wall nearest the house, the wall taken down. With the new info, the fog is now lifted. 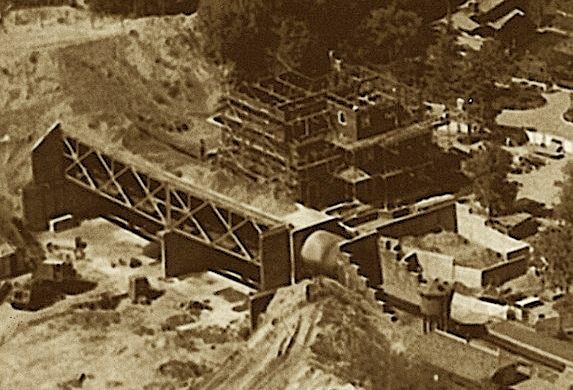 previously were hard to decipher, like this construction photo . 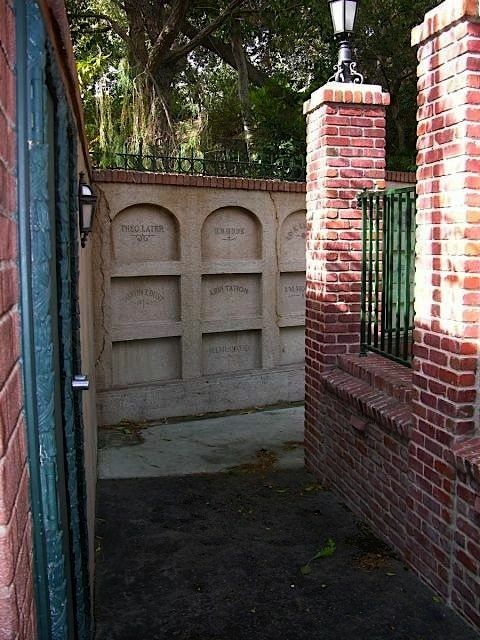 . .
altered and opened up for the relocated queue entrance, long before opening. 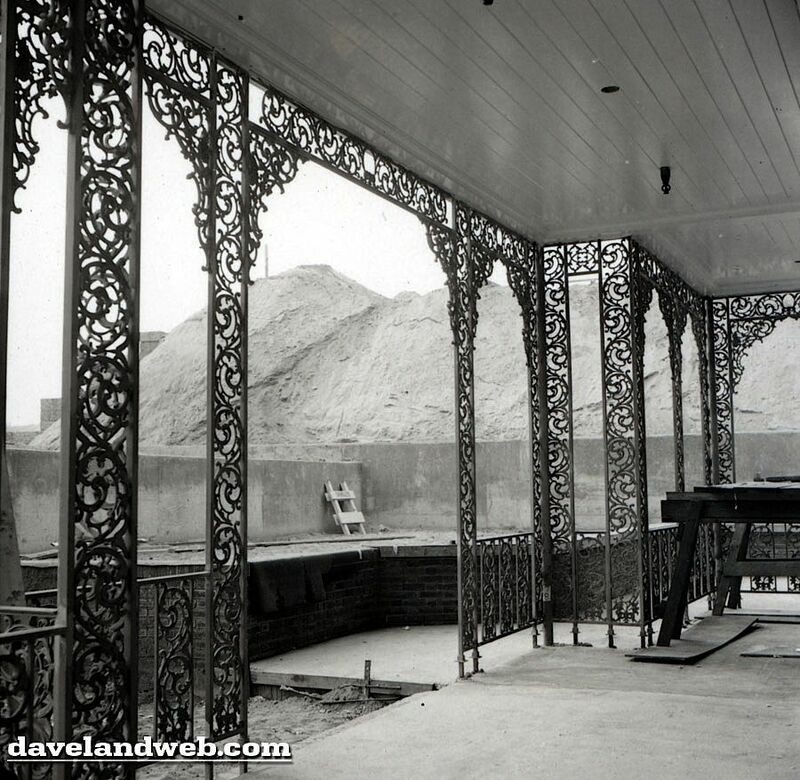 Notice the ironwork topping the wall. 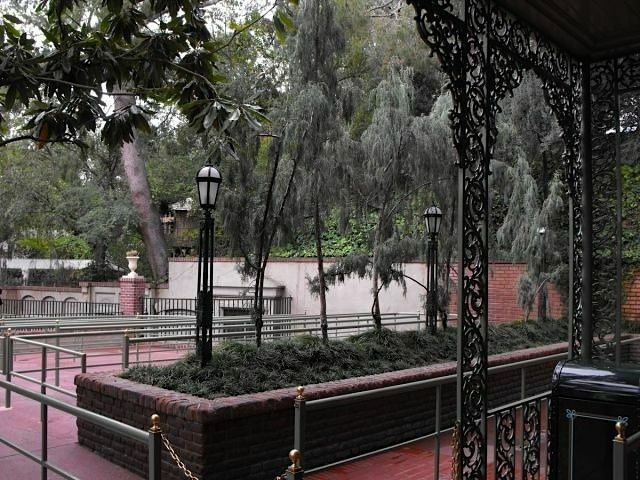 Through all of the alterations to this area, both before and after opening day, the original ironwork was retained in many places, recognizable by its distinctive design. 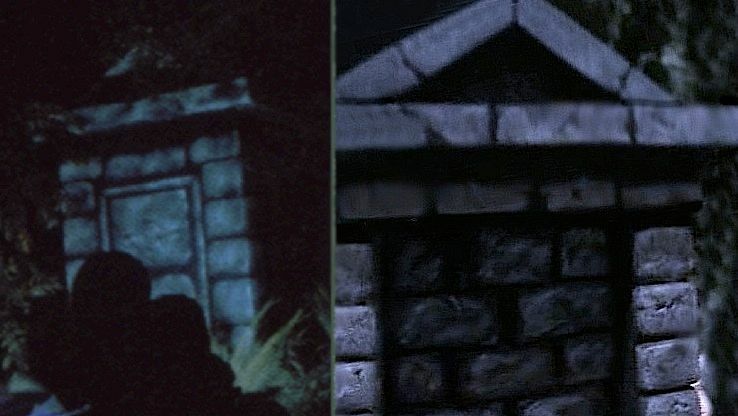 It's already there in the concept sketch and in old photos. 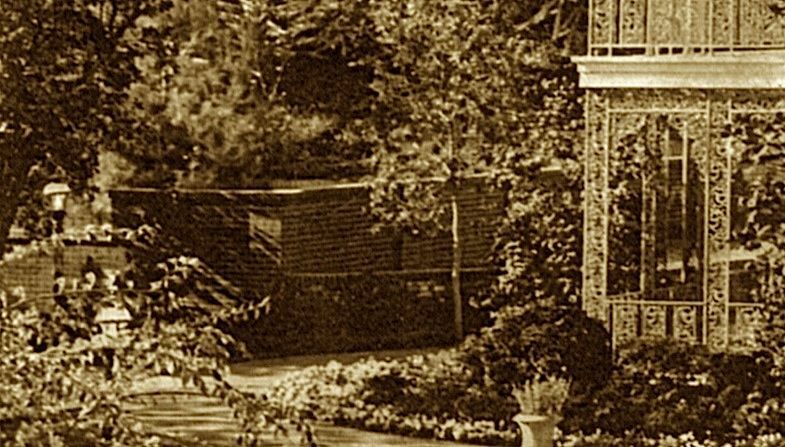 Today, we may perhaps see it as a relic from the lost graveyard, marking another piece of long-forgotten Mansion history. For a sequel of sorts to this post, check out this. For another one, check out that.